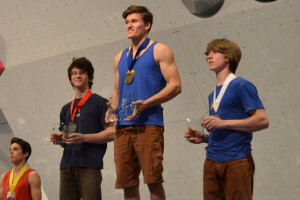 Granite Arch’s Joe Diaz WINS THE SILVER at USAC American Bouldering Series Youth National Championships. After 7 years of hard training and many attempts at the coveted goal of qualifying for USAC ABS National Youth Finals, Joe Diaz this weekend has surpassed his hopes and dreams. Competing by himself but in the name of his fellow competitors at Team Granite Arch, Joe not only pushed through qualifying and semi Final rounds but outdistanced his opponents on the final day. When the smoke cleared, Joe Diaz stood on the silver medal podium level with a surprised grin on his normally serious face. This placement gives Joe an invitation to join the U.S. National Team and to compete at World Championships in Arco, Italy in August. Granite Arch owners, Bob and Lynn Balzhiser have expressed their pride in Joe, his coaches and the team. Go Team Granite Arch! GO JOE! !